Don’t fret, if you thought the previous generation Acadia was a winner, then GM’s got something seriously awesome in store for you with this revamped version. Don’t fret -- if you thought the previous generation Acadia was a winner, then GM’s got something seriously awesome in store for you with this revamped version. GM’s kicked everything on the Acadia up a notch (or five) by not just making this updated crossover look better, but also by stuffing it full of the latest technology, as well. 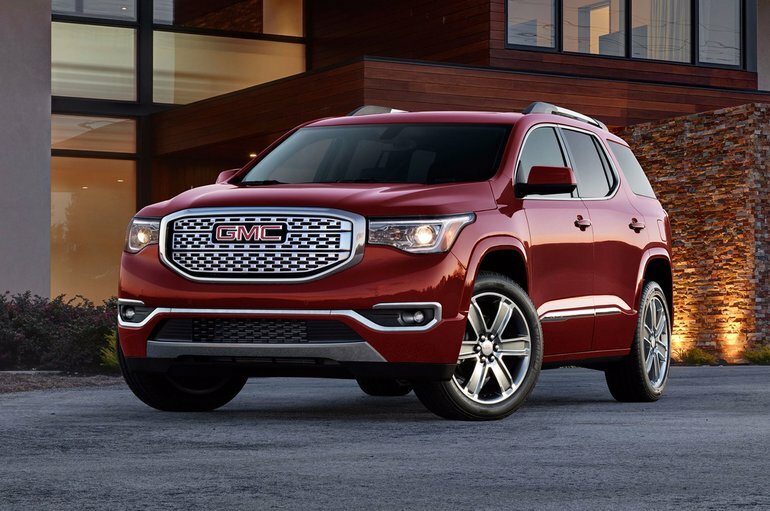 The 2017 GMC Acadia slots itself perfectly between the compact Terrain and the full-size Yukon, offering a fabulous blend of the two. While it is much more compact in size in comparison with the Yukon, it also offers up a large amount of interior space with available seating for up to seven passengers (with the correct model selected). The 2017 GMC Acadia offers split-folding second-row seating, which allows for easier cargo storage. There’s also the fact that you can slide the second row passenger-side seat forward even if a front-facing baby seat is installed. The rear seats in the Acadia offer a 50/50 split, and can even fold completely flat for a total of 2,237 litres of cargo space. All seats can be folded down from the rear of the car via levers. There’s a new engine in the 2017 GMC Acadia that only adds to the crossover’s attractiveness: a 2.5L engine (standard) and an all-new available 3.6L V6 as another powertrain option with an estimated 310 horsepower that allows for a 4,000lb towing capability. Both engines are paired with a 6-speed automatic transmission, and both FWD and AWD drivetrains are available. Young families think a great deal about safety on the road – almost as much as they think about comfort and performance behind the wheel. So, GM has outfitted this latest Acadia with a host of passive and active safety features such as available forward automatic braking, forward collision alert, surround vision camera system, pedestrian braking, lane keep assist with lane departure warning, and lane change alert with side blind zone alert, as well as front and rear parking assist. To find out more about the brand new 2017 GMC Acadia, make sure you stop by Bruce GM Middleton to speak to one of our experts. Don’t forget to sign up for a test drive as soon as the Acadia models hit the showroom floor, either.